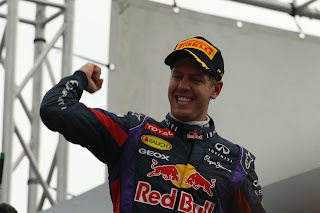 Why the hate for Sebastian Vettel? It wasn't the biggest shock. 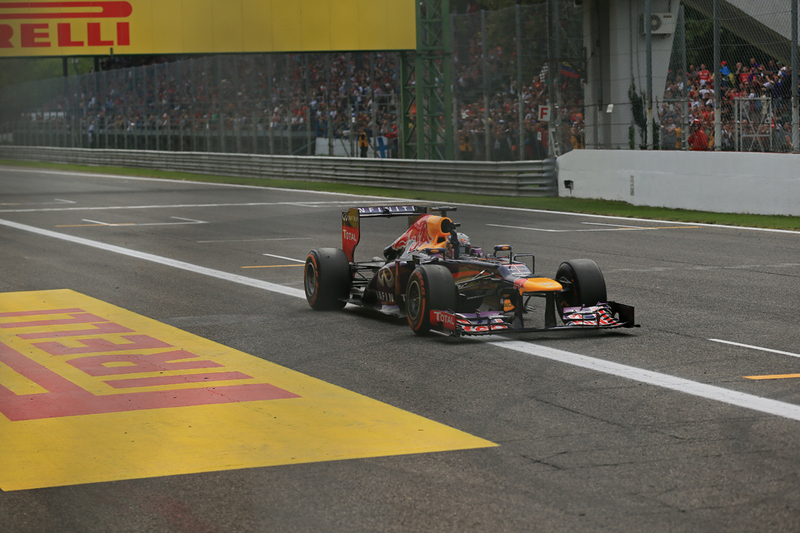 Sebastian Vettel having won the Italian Grand Prix last Sunday was jeered when on the podium by the massed tifosi in attendance. Not a shock, as I said: after all the fanatical Ferrari fans at Monza have been prone to do similar for as long as a lot of us can remember. Alain Prost and then Ayrton Senna were on the thick end of it for years, as was Lewis Hamilton after winning here 12 months ago. But also it's not a shock as it's the third race of this year (at least) wherein Vettel has received a conspicuous thumbs down from the assembled gallery at an F1 race. I've outlined on this site before my view on booing drivers (here and here - in short I don't like it) and I don't wish to re-tread old ground. But I do wonder more broadly what exactly Sebastian Vettel has done to offend people. On the face of things it may not be obvious: he is after all a very talented driver, a very smart individual, as well as is highly engaging and friendly with the media. And as a driver he's about as complete these days as can be reasonably expected - the 'he can't pass' idea really should have been given a dignified burial years ago, such is the regularity that he's shown different. And, oh yeah, he's well on the way to claiming driver's title number four for himself. To top it all off he's only 26. 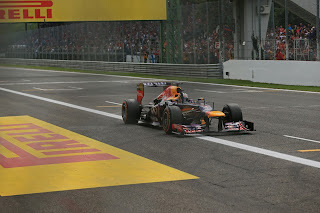 Usually when the whole matter of Vettel's apparent unpopularity is raised the stock justification are the events of this year's Malaysian race, wherein Vettel of course defied a team order and ambushed his unsuspecting team mate Mark Webber to win. Some say more pointedly that, rather than it being about that act in itself, they found disingenuous his changing of his line of defence at least once in the aftermath, migrating from being apologetic to being unrepentant (and even to being an odd amalgam of the two). This all no doubt is part of it, or at least doesn't help, but I don't take the view that it's all of it. If nothing else Seb-bashing seemed a popular pastime even before Malaysia, and it strikes me that many use Malaysia as post-rationalistaion of something that they felt anyway. An element of the explanation of course is that habitual F1 winners in the modern age rarely get much affection in their own time, either from their vanquished or from anyone else. The days of Peter Collins and Mike Hawthorn after the 1957 German Grand Prix talking excitedly about Juan Manuel Fangio's towering talent after he'd wiped the floor with them in the race just finished are long in the past sadly. And the desire of those watching on to see someone else win will sway views. I sometimes suspect too that the rather snobbish perception of Vettel's (and Red Bull's) 'arriviste' status doesn't help either: in other words the success grates more as it is seen to come from the Johnny-come-latelies. Perhaps if it was Alonso or Hamilton winning in a Red Bull, or Seb winning in a McLaren or Ferrari, people wouldn't get so wound up. But another common mention in response to the 'why hate Seb?' question is that some claim he's not deserving of his success. We live in an age blessed with many world-class F1 drivers: Alonso, Hamilton, Raikkonen and of course Vettel himself. Perhaps some think that Vettel's hogging the honours, or even that he's depriving more worthy pilots of them given his access to a succession of excellent Red Bulls. Some, in a related fashion, claim that Seb has had it too easy in totalling up his accomplishments. And in the latter part they might have a point, however inadvertently. Not for nothing when Senna's legend is spoken of it is his drives of 1993 in a McLaren markedly slower than its Williams rival that are often cited. Similar with Michael Schumacher and the recalcitrant Ferrari F310 in 1996. In other words, it's when trying to overcome a car's shortcomings that a driver's personal contribution is most obvious. Seb hasn't recently had many opportunities to demonstrate this for himself. When the day comes that he does I'd imagine a few will be converted. But nevertheless most of the case against Vettel strikes me as nonsensical. For one thing, let's not forget that F1 is not a single make formula, and seeking what Mark Donohue called the unfair advantage has always been a fundamental part of the game. There equally is absolutely nothing to say that F1 success has to be shared around equitably; it instead has to be earned by driver and team. To borrow from Clint Eastwood in Unforgiven: 'deserve' has nothing to do with this. And Seb's success is not absurd: while we can debate their relative merits all day Vettel surely is ensconced firmly within the top four drivers operating in the sport right now, and you could make a coherent case for him being better than any or even of all of them. He'd be considered a great driver in any era of F1. And as for the idea that he's lucked into his success, no driver in F1 works harder at his game; no driver leaves less to chance. One of these days it'll all get its proper appreciation, mark my words.